One of the most common perceptions in the automotive sector is that Millennials no longer want to own and drive a vehicle. The theory is that, in the past, vehicle ownership was the primary way millennials interacted socially and that with all the social media options available they are less likely to need a vehicle for this purpose and are thus are not even getting a drivers licence let alone owning a vehicle. A complimentary theory is that youth unemployment rates are higher today than in the past so younger consumers also can’t afford to own a vehicle, especially if you add in the cost of insurance, and thus their ownership levels are lower. I’ve questioned these theories for quite some time. I point to two pieces of hard data. First is overall ownership of vehicles in Canada. 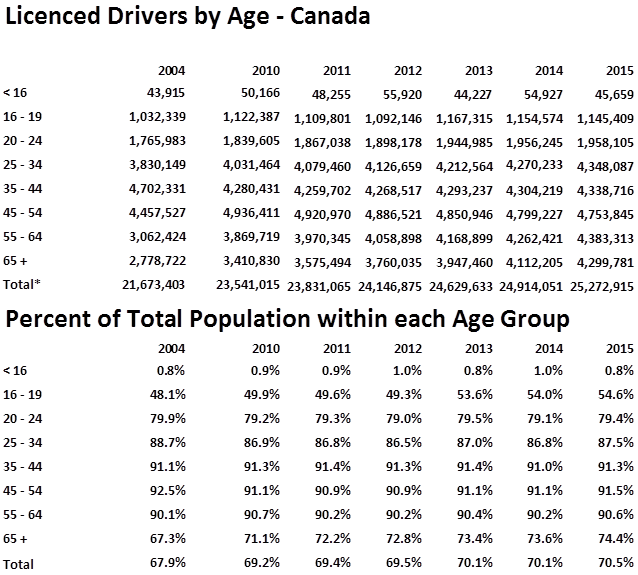 The second is the percent of the population by age group which are licenced drivers. In 1960 ownership per driving age population was only 50.4 percent in Canada with little growth in the following decade. By the year 1990 ownership had grown to 70.1 percent of the driving age population where is flat-lined for the following decade. This all changed at the turn of the century. Over the last 17 years ownership has exploded in Canada and now stands at 87.0 percent. If you don’t think that is significant it translates into an additional 9.6 million light vehicles on the road today than in the year 2000. Think of that number’s impact on fuel demand. So, I ask … if total ownership is growing so fast how could it be possible for ownership by millennials to be going down? Mathematically it would be near impossible. The second piece of data is licenced drivers by age. The percent of the youngest cohorts with driver’s licences has increased from 48.1 percent to 54.6 percent over this timeframe. And most importantly the percent of licenced drivers of the following two cohorts hasn’t declined. So, the view that millennials are not even getting a drivers licence is totally 100 percent false. It is actually increasing for the youngest population of driver’s age and is relatively high and stable with the following groups. The over 65 age group is also interesting in that those with a licence has increased from about two thirds of their population to a little over 70 percent. The absolute number with a licence has also increased from only 2.8 million to about 4.3 million an increase of 1.5 million more potential older drivers. This last group may account for some of the overall increase in ownership from the table above but it doesn’t account for all of the increase. Now just because someone has a drivers licence doesn’t mean they own a vehicle but it certainly means they are more likely to own a vehicle. Combine these two databases and you have fairly conclusive proof that millennial ownership of vehicles is NOT declining in Canada it is actually increasing. We don’t have the actual levels in each year but we certainly believe ownership is going up for millennials and also for our oldest consumers. There are a number of implications for the fuels industry related to these trends. Second, this information highlights the continued importance of seniors. Millennials have captured the bulk of attention in the automotive sector and I get that … they are young and during their life they will buy a dozen or more vehicles. Get them while they are young and you might have a customer for life. But look at the stats. The number with drivers licences have increased by about 600K to 700K. Over the same time period the number of seniors over 65, with driver licences have increased by close to 1.5 million which is at least twice as much. That’s a lot of fuel demand. Third, closely related to this is the growth in the luxury market. A senior is much more likely to be able to afford a luxury vehicle than a millennial. This is one of the reasons why the luxury market has been the fast-growing segment in Canada for quite some time moving from less than 5 percent of sales to about 12 percent over the last number of years. Luxury vehicles are less fuel efficient than mass market vehicles so this is also positive for fuel demand. Fourth this analysis clearly shows the problem with current Government policy related to climate change which is focused almost exclusively on electrifying our vehicles. There are various views and the rate of growth on battery electric vehicles but even if some of the most optimistic forecasts come true it actually will have a very small impact on CO2 emissions and fuel demand since the growth in ownership is leading to millions of additional vehicles on the road and even though they are more fuel efficient the added volume is very positive for fuel demand.